SHADOWSTRIKE1’s guide to improving your connection quality and opening your NAT. Last week I posted my explanation of Halo Reach’s co-op and firefight networking model, and why some players experience severe lag when playing these gametypes. If you are having difficulties with your connection speed, then I’ve got good news for you. SHADOWSTRIKE1 is here to help you improve your connection quality and open your NAT if you need to. Even if you have a high-speed internet plan, this guide can help you optimize your home network to get the most from your connection. I’d just like to take a moment of everyone’s time and share some ways to improve your internet connection. As a Computer Information Science major with a focus in Networking Security and Design, I like to try to share my knowledge to improve everyone’s connection. So let’s get started. Why should I want to improve my connection? The answer is simple. Halo is a Host-Client based game. That means that one player (hopefully with the most stable connection) is the host, and each other players connect to them. Improving your connection not only raises the chances of you gaining host, but improves your connection to everyone else, and decreases packet loss. Basically, better connection = less lag. If you are experiencing lag in more than once every 10 games, chances are, it’s YOUR fault. How Can I Improve My Connection? Wired is simply faster than wireless. It’s also more reliable and consistent. Though not as convenient, just a better way to go. Try visiting http://www.speedtest.net/ and running a test. If your results are lower than 10MB/s download, 1.5MB/s upload, and more than 40 ping, you should try to improve your connection (Note, these numbers change depending on variables such as if you are wireless, how far you are from your router, and what type of Ethernet cord you are using). If you are getting results lower than you are paying for, ask them to fix it. This is where you’re going to make a huge difference at no cost but your own time. Xbox LIVE prefers certain ports on your router for connections. However, sometimes these ports are used by other things on your network. 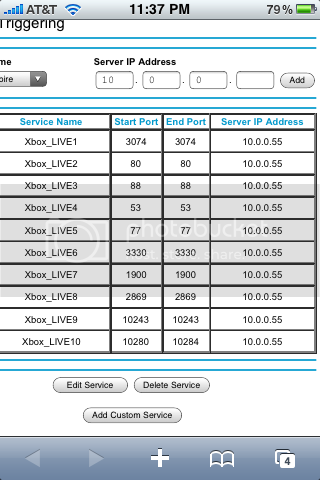 Port Forwarding these ports to your Xbox’s connection “reserves” these ports specifically for Xbox LIVE. This process will also Open your NAT. To continue with this process, go to a PC you have at home. Open up an internet browser (Internet Explorer, Firefox, Chrome, etc.) and type in your home IP address (this is usually 192.168.1.1 or 10.0.0.1). You will now be asked for a login and password (the login is usually admin and the password is usually password unless you changed it). Now, locate a section called “Port Forwarding” or “Port Triggering” or “IP Forwarding” or something similar (every router is different). Now, you may notice that unlike other IP forwarding guides, I forward 11 services rather than the 5 or so they do. That is because those extra services are for Video connections and such that Xbox LIVE uses as well. Think of it as a FULL 360 port forward, not just gaming. Now, you are going to need to open up Command Prompt. You can do this by going to “Start” and clicking “Run” or by holding the “Windows” button your keyboard, and pressing the “R” key. Once it pops up, type in “cmd” (without the quotes) and press Enter. Now you have opened Command Prompt. Now type in “ipconfig /all” (without the quotes) and press Enter. A bunch of info will be listed. Look for a section labled as “Ethernet adapter Local Area Connection“. Look for the info labeled as “Subnet Mask“, “Default Gateway“, and “DNS Servers” and write down the addresses they list. Now, it’s time to change your Xbox’s IP settings. Go to your Xbox and turn it on. Now go to the System Settings by going to the “My Xbox” section and scrolling right. Open it up and look for “Network Settings“. Select your connection type, and then change your settings from Automatic to Manual. It will now ask you what your Xbox’s manual IP address is. Now input the IP address you chose (I have been using 192.168.1.55 for an example). You will also be asked for your Subnet Mask and DNS Servers, which you can fill in with the information you wrote down earlier. After you’ve entered all the new information, restart your Xbox, and enjoy your improved connection. I am thinking of making a video of how to do this process. If you would be interested in this, please post saying so. Thanks to SHADOWSTRIKE1 for putting this excellent guide together. 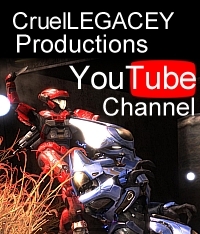 If you have questions or comments, feel free to post them below, or visit this thread on the Halo Waypoint forums. To see more of SHADOWSTIKE1’s work, visit his official website at www.shadowstrike1.net, where you can find his complete collection of intructional videos and strategy guides. SHADOWSTRIKE1 also offers a wide range of Halo and network related services to help you step up your game. While you’re at it, don’t forget to check out his official YouTube channel as well! This entry was posted in Articles, Halo 4, halo reach. Bookmark the permalink. What about PS3 and PS4 users? I have Clear Internet service since I live in Portland, Oregon and it did not ask me for a service name at the end and I have enabled UPnP , add a DHCP lease reservation formy Xbox and I still have moderate NAT type. And on my Xbox I have done everything correct that was said above and my NAT type is still moderate! The Internet service is high speed and I don’t know what the problem is. I have three Xboxes on my home connection. Is there a way we can set up port forwarding to boost our speeds such that we all benefit? I do not have the option to select both tcp/udp with my gateway. In this case would I just add the same connection twice but each using the different protocols? Many thanks. I couldn’t set my first port to 3074 it said it was already used so i changed it to 3075, is that ok? This worked incredibly well. My friend and I were playing co-op, he in MN and I in TX. We were experiencing horrible lag that almost (almost) made it impossible to play. It took 15 minutes to do this, and the lag is gone. Thanks a lot! While this is nice and might work well for those whose households only have one 360 in them, what about those of use with 2+ units? I have a wired gigabit network with a ping of 30ms, d/l at 20.27 mbps, and upload at 2.95 mbps. However when trying to host a gears 3 co-op game it always says my nat is moderate or restricted… but since there are 3 360s in the house i cant forward the ports to just one of mine (roommates would kill me). any suggestions?